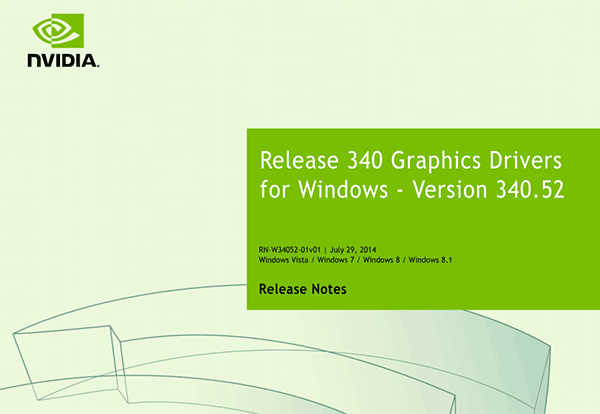 Nvidia released its GeForce 340.52 WHQL certified drivers yesterday. One of the main additions to the driver is that now Nvidia GTX graphics card owners can take advantage of GameStream technology to stream their favourite PC games to the new SHIELD tablet. The drivers were released to coincide with the launch of that tablet which we had a close look at yesterday. As a quick reminder GameStream allows you to play any of over a hundred PC games titles on your SHIELD tablet screen or a big screen attached to it using the bundled HDMI cable. The list of compatible titles contains plenty of AAA titles such as Battlefield 4 and Bioshock Infinite. With this WHQL driver release Nvidia has also taken the opportunity to introduce the usual set of optimisations, new and updated SLI profiles, extra 3D Vision profiles and bugs/issues fixes. The driver benefits from updated software modules including NVIDIA PhysX System Software - version 9.13.1220, HD Audio Driver - version 1.3.30.1 and GeForce Experience - 15.3.13.0. First of all Nvidia says players will enjoy "the best possible gaming experience in Metro: Redux and the Chinese release of Final Fantasy XIV". While those games are headlining beneficiaries we are told that the new driver "introduces key DirectX optimizations which result in reduced game-loading times and significant performance increases across a wide variety of games". The main fixed issues in this driver update include the fixing of a lock-up issue when using tiled 4K displays running a 3D application. Also HDMI audio shouldn't need resetting to get it to work. Finally Chrome browser users shouldn't experience the rendering issues that used to kick in after a period of time previously. As usual head over to the official Nvidia Drivers page to get this GeForce 340.52 WHQL certified driver for your particular version of Windows. Most under-whelming nVidia driver update I can remember. I for one appreciate this update. Had problems opening Media Player Classic with the last driver, which is now fixed with this one and it is normal to release drivers when for their new products. Be nice if they weren't a gigantic hassle to install. The ‘experience’ couldn't even manage to download them “check internet”, an ‘express’ update “failed”, a ‘clean’ install “failed”. Had to go around manually deleting everything Nvidia related to get it to work. Installed mine last night, rebooted and massive screen corruptions. I had to do a system restore. Actually, the past couple r340 drivers have been quite decent, performance and stability wise, for both Fermi and Kepler cards. While performance improvements are obviously always welcome, I sure welcome bug ironing the same or even more. Not much love for Geforce Experience, though. About the new dynamic cache feature, it's interesting and it's almost always recommended to be enabled, yet for some reason cache size is static, set to 120MB (IIRC), which in all honesty just isn't enough for any system that happens to run a dozen or more games at a given time.